Laodicea Langston, Dicey as her friends and family called her, was the daughter of Solomon and Sarah Bennett Langston of Laurens District, South Carolina. She was born May 14, 1766, on her father’s plantation. Dicey’s mother died when she was a little girl, and she was raised by her father and brothers. She was described as of below medium height, dark-eyed, proud, imperious, and high-spirited. She was also considered graceful and attractive in appearance and in manner. When the Revolutionary War began, Dicey’s brothers left the plantation to fight with the Continental Army. They camped in the forest with a small band of Patriots, so the plantation wouldn’t suffer the consequences of their patriotism. To save the family from difficulties, they visited only infrequently in secret. Through it all, they managed to maintain communication with Dicey, who had become an outspoken patriot along with her brothers. 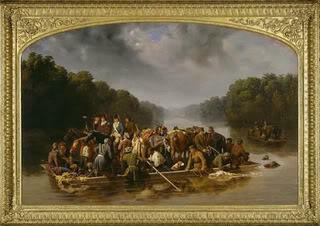 Scene during the Revolutionary War showing General Francis Marion and his men on a raft crossing the Pee Dee River in South Carolina. Marion led a small force that employed the tactics of guerilla warfare, wreaking havoc on the British. The success of Marion’s motley crew depended on its mobility, on changing camps constantly and on fighting at night. Dorcas Nelson was the daughter of Captain John Nelson of South Carolina, a native of Ireland. The ferry over the Santee River, established and kept for several years by her parents, is still called Nelson’s Ferry; and many of their descendants continue to live on both sides of the river. Anne Hulton was a sister of Boston’s commissioner of customs and, like some 15 to 35 percent of the white colonial population, a British Loyalist. 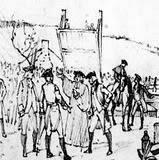 Loyalists were American colonists who remained loyal to Great Britain during and after the Revolutionary War. They were often referred to as Tories, Royalists, or King’s Men by the Patriots, those who supported the American cause. Most of what is known about Anne Hulton comes from the letters she wrote to her friend Elizabeth Lightbody between 1763 and 1776. Of Hulton’s published letters the most frequently studied have been those written during 1767-1776, collected in Letters of a Loyalist Lady (1927). Scholars first noticed Hulton through her brother, Henry Hulton, who was a commissioner of customs (a tax officer) in Boston during the nine years preceding Revolutionary War. The letters offer a firsthand view of political relations in the prewar period, as well as Loyalist views of the American Revolution. They also chronicle the everyday life of an upper-class eighteenth-century woman in colonial America, and they portray a friendship between two women who worry about one another’s health, share news of friends and relations, and maintain their correspondence even in wartime. Hulton’s work offers the modern reader insight into various facets of life in the colonies: social relations, gossip and fashions; agricultural practices, observations on native plants and animals and domestic economy; diseases and cures; and the family ties and responsibilities of single women in the eighteenth century. Anne Hulton’s birth date is unknown. E. Alfred Jones has noted that her father was John Hulton of Chester and that she never married. She did, however, become an important member of her brother’s growing family, which consisted of Henry, his wife, Elizabeth, and the four sons whose births were noted in Hulton’s letters. In September 1767, Anne announced two exciting events: Henry Hulton’s appointment to a post in the colonies and the birth of his first child. Henry and his wife wanted Anne to accompany them to their new home, and he had promised to take good care of her there. She also laid out her intentions to do something productive in the colonies. She planned to establish herself as either a merchant or planter. Henry Hulton left England ahead of his family, arriving in Boston in November 1767. Anne Hulton left for the colonies early in 1768, traveling with Elizabeth and baby Thomas. On her arrival in Massachusetts five weeks later, Hulton got a clearer view of political life there, which presumably deflated her ideas of becoming a tradeswoman. Thirty-year-old nurse Sarah Tarrant bravely challenged the British soldiers who occupied her town in February 1775. In November of 1774, Colonel David Mason was commissioned by the Patriots of the Massachusetts Committee of Safety as an artillery officer. He had some experience in this during the French and Indian War at Fort William Henry. At the end of the war in 1763, he had formed an artillery company in Boston, Massachusetts. He had bought 17 old French cannon, 12-pounders, and was having them refit and mounted on carriages in Salem, Massachusetts. Mary Gould was born in 1735 in Newport, Rhode Island. 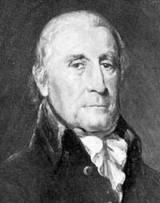 Benjamin Almy was born on December 16, 1724. Mary Gould married Benjamin Almy on October 22, 1762 at Trinity Church in Newport – his church. She was a Quaker; he was Anglican. When sides were chosen over the issue of American Independence, Mary remained loyal to the crown. Benjamin joined the patriot cause, as did some of Mary’s other relatives. And like hundreds of other Newport volunteers, he left his wife and family behind and joined the Patriot army. Her diary is addressed to him. Hannah Harrington, born around 1737, was one of the great women of the American Revolution. Elijah Clark (or Clarke) was born 1733 in Edgecomb County, North Carolina, and was the son of Elizabeth Darden, who was the niece of George Washington and the second wife of Governor Stephen Heard. Hannah Harrington married Elijah Clark around 1763. In 1774, Hannah and Elijah moved to Wilkes County in upper Georgia, because of the availability of new lands. They settled in an area that became known as the Hornet’s Nest, which was several miles northwest of Fort Heard, between the roads leading from the Broad River and Cherokee Corner to Augusta. Hannah was a large muscular woman whose every movement showed efficiency.